Thanks to Tim Bahula for contributing this post! While digramming Galatians 5:8 I've come across a construction I haven't seen before: a preposition followed by a participle, i.e., a participle that is the object of a preposition. Having not encountered this construction previously I attempted to search for its frequency... without success. Would someone please explain to me how to find this? Is there a short video or some written tutorial instructing the Libronix user on how to determine when to use a "syntax search", a "graphical query", and a "morphological Bible search"? While I can't hope to answer the question for all cases, I intend in this post to demonstrate why a syntax search is the preferred method for finding a participle as object of a preposition. Before the advent of syntax searches, a morphological search was the best choice for trying to find this construction. In this first video clip (view it here), I use a morphological search. The "[=P] before 1-2 words [=V??P-???]" search returned 752 occurrences in 365 verses, including Gal. 5:8. But it also returned Gal. 5:6, where the participle is in the nominative case and is not the object of the preposition. I realized after I recorded the video that the morphological search could be refined to exclude the nominative and vocative case. The "[=P] before 1-2 words [=V??P-?[GDA]?]" search returned 406 occurrences in 197 verses. However, there are still results returned where the participle is not the object of the preposition, such as Gal. 3:23. The problem lies in the proximity constraint. It is simply not possible to open the window wide enough to catch all occurrences without making it so wide that it includes occurrences that don't really fit the criteria. In the second video clip (view it here) [UPDATE: link fixed], I explore using a graphical query (right-click, "save target/link as..." to download Preposition Participle refined.lbxqyg) to search for the construction. The results are the same. The upside is that the results are returned faster when using a graphical query, the downside is that creating the query is not as intuitive as creating a morphological search. Finally, the third video clip (view it here) explores using a syntax search (right-click, "save target/link as..." to download OpenText- participle as object of preposition.lbxstq) to find the construction. The easiest way to create the syntax search is the mimic the structure of the example. The search results include 113 occurrences. I have not verified them... yet. It would be interesting to see if any legitimate results from the morphological search are missed by the syntax search. The downside of the syntax search is that it takes quite a bit longer to return the results... on the other hand, it beats having to weed through false positives. The syntax search is a great tool to use when searching for words that must be in a certain relationship and there may be intervening words. It seems that the documentation is still weak. Learning to construct the queries takes some practice and the Logos website has some good examples of creating syntax searches. The link to the second video is not working. Thanks for the example. I love to learn how to use this tools with practical uses. I am interested in seeing what will be your conclusions. Thanks for the heads-up. The link has been fixed. CrossMarks Christian Resources: Where I publish my Bible Study, church, and pastoral resources. 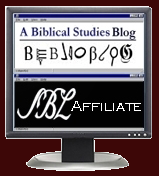 It is also where I publish Brian Stoffregen's exegetical notes on the RCL. MGVH at LTSG: My academic homepage with links to everywhere I go. Logos for Mac and Accordance: Smackdown!